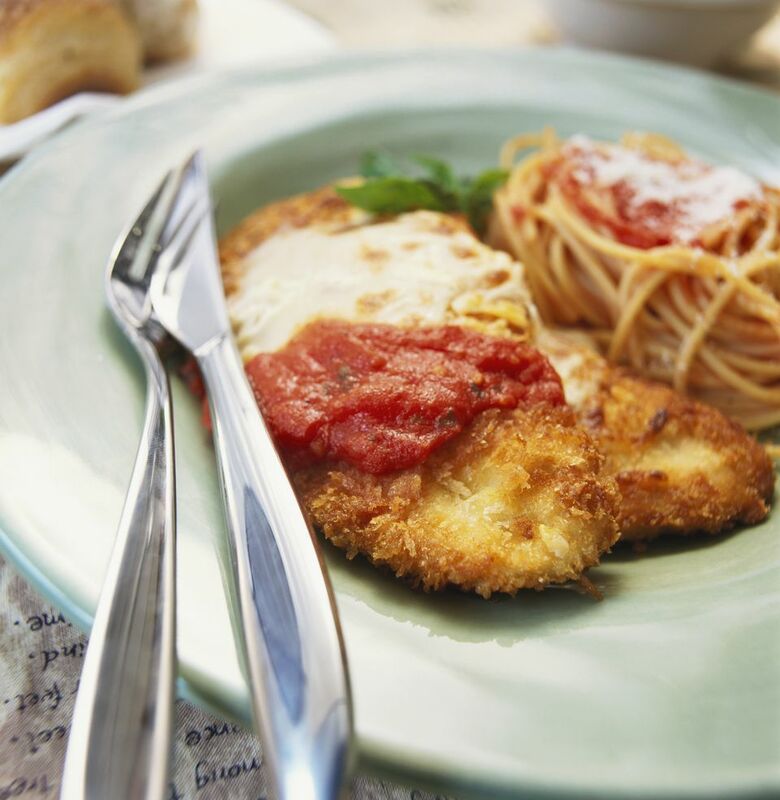 We're all familiar with Chicken Parmesan, where a chicken cutlet is breaded and fried until golden, then topped with a rich tomato sauce and gooey mozzarella cheese. But what about replacing the chicken with turkey? This poultry swap will maintain the original recipe's texture and appearance but will bring a slightly different flavor to the dish. An ideal dinner choice when you have eaten so much chicken you feel like you are going to start clucking. This recipe calls for a jar of prepared spaghetti sauce, but if you prefer to make your own you can simply add dried basil and oregano to canned tomato sauce. For a slight twist on a classic, sauteed onion, bell pepper, and mushrooms are spooned on top of the cutlets before covered with sauce and cheese. Perhaps this is a way to sneak some vegetables into your kids' diets! This dish is best served alongside pasta. Beat egg and milk together in a small bowl. Place breadcrumbs in a shallow dish. One at a time, dip turkey cutlets in the egg mixture then into the breadcrumbs until thoroughly coated, placing on a baking sheet as you go. Heat olive oil in a non-stick skillet over medium heat. Cook cutlets in the hot oil until well browned, 3 to 4 minutes a side. Place in a shallow casserole dish. Add sliced onion, red pepper and mushrooms to the hot skillet. Cook until tender, about 5 minutes. Spoon the mixture on top of the cutlets. Pour the spaghetti sauce over and sprinkle with Parmesan cheese (as much or as little as you like). Bake for about 20 minutes. Top with mozzarella cheese and cook until cheese is melted and browned, about 5 minutes. Serve over hot pasta and enjoy!